These shoes are clearly sparkly and clearly stunning! Open-toe vegan suede mule heels feature a sparkly rhinestone-embellished toe strap and an extra wide clear PVC vamp panel for an illusion design. 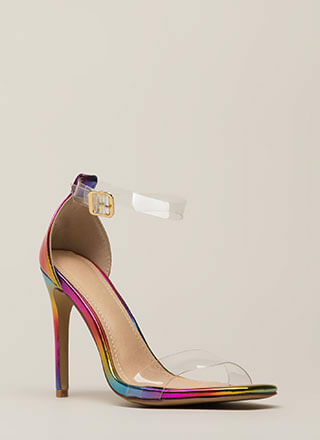 Shoes are finished with a stiletto heel, a ridged sole, and no closures.